Please note - if you would like to visit this area, please read the directions below as the landowners do allow visitors if they respect the property. Many thanks! 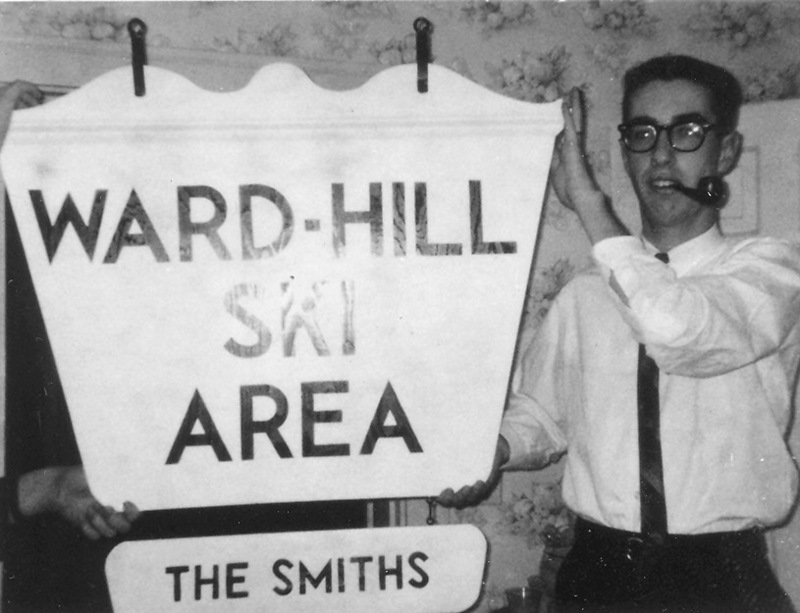 The sign for Ward Hill, 1965, from Wayne Smith for his parent's 25th wedding anniversary. 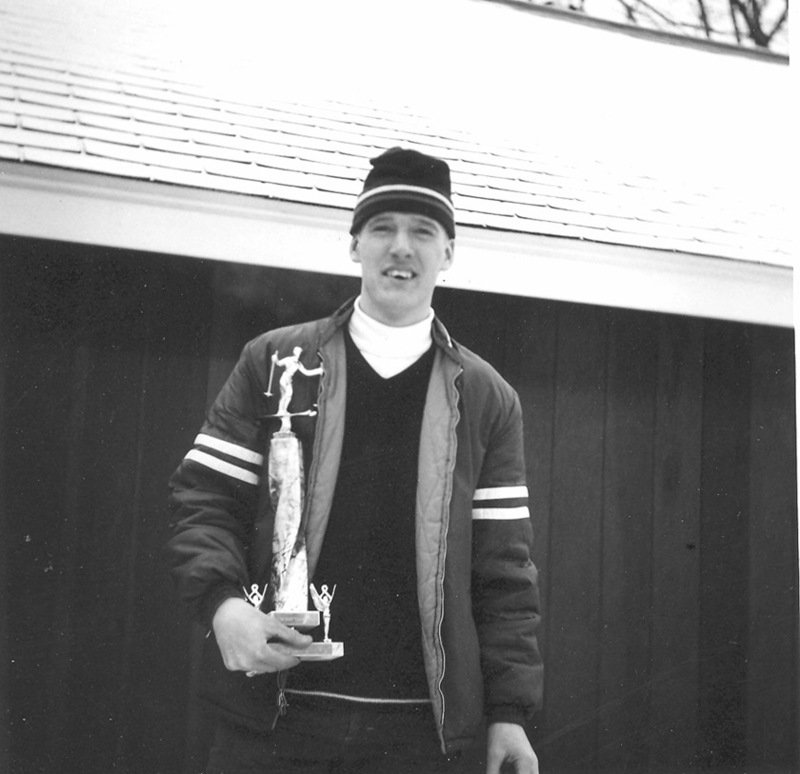 We are grateful to Doug Smith, whose parents, Herb and Doris, owned and operated this ski area. 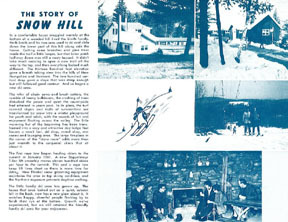 His very detailed history of the ski area is below, along with his family's historic photos. For most photos, you can click on them to view the larger version. 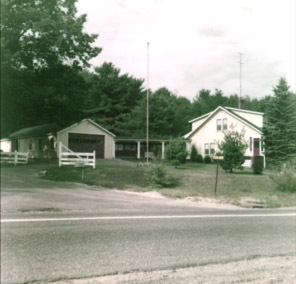 In the spring of 1959, Herb Smith purchased a house at the corner of State and Ward Hill Roads in Phillipston (shown on the right). Herb had accepted a job in neighboring Athol as a sales engineer for the L. S. Starrett Co., a manufacturer of precision instruments, saw blades, and flat stock. The yellow house had a breezeway, a two car garage, and a large room behind the garage for the previous owner’s plumbing parts business. But the house needed more room for the family so the upstairs had larger dormers added for two bedrooms. After renovations to the house were completed in the summer, the rest of the family (Herb’s wife, Doris, and their sons, Wayne and Douglas) moved from Willow Grove, Pennsylvania. 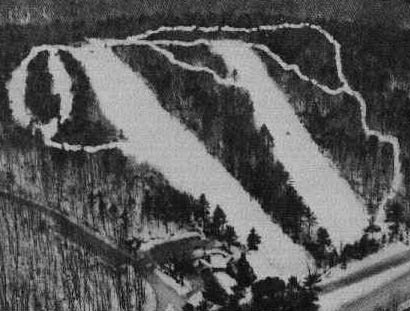 In the spring of 1960, as the major construction of a re-aligned Route 2 was being carried on across the street, Herb’s idea for a ski area took root. Herb talked to one of the bulldozer operators of the construction company, Charlie Crespo, to see if he could hire him and the bulldozer for those times when he wasn’t working on Route 2. For a couple of weeks, Charlie and his dozer pushed trees and stumps to the left and right as he advanced toward the top of the hill. The Cat D9 dozer was strong enough that we didn’t bother to first cut down the trees. A large hunk of ledge was encountered about a third the way up the slope. A decision was made to make it into a “jump”. It was really just a large lump of earth and rock with a steep angle on its front and sides. It added a small degree of challenge for the skiers. Once Charlie was done, Herb employed a some of the fellows from Starrett’s to hand grade the slope, sow seed, and spread bales of hay. It was huge effort to get grass growing before rains washed the bare earth to the bottom of the hill. Operating a ski area required a way to get the skiers up the hill, a place for them to park, and a place to warm up and grab a snack. Herb worked with a local iron worker to build the frame that would hold two sheaves for the rope to go around as it was pulled up the hill. To this assembly, a new four-cylinder commercial engine was attached. Around that was built the first engine house at the top of the East Slope. Thus began the weekly effort to get gasoline hauled to the top of the hill. Before snow fell, the two 55-gallon tanks were filled from fuel hauled up on our 1946 Jeep. 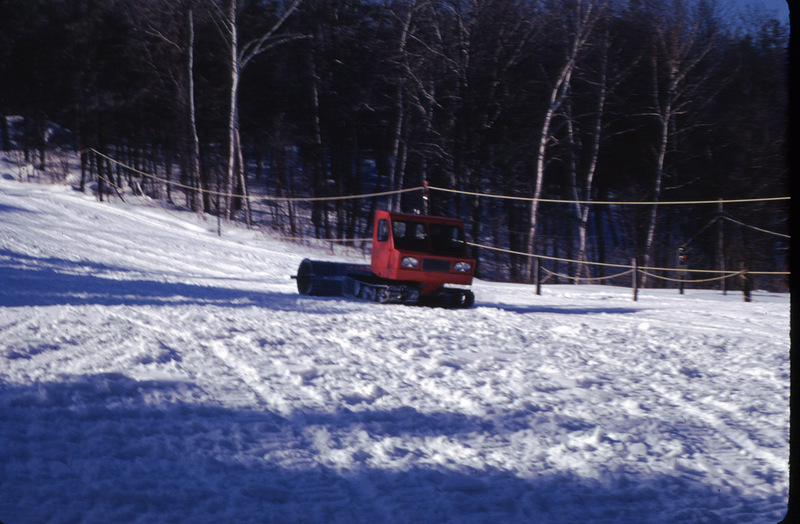 Once the snow was on the ground, gas was either carried up the hill by the engine operator or precariously balanced by someone going up on the rope tow. Since these methods proved to be tiring and dangerous, a box sled was later built. (It was a plywood box with two old skis fastened to the bottom.) It was lashed to the tow rope and slowly pulled to the top. Even with walkie-talkies to communicate with the bottom, at least two people were required at the top to coordinate the approach of the sled so the rope tow could be stopped as the sled reached the top. Obviously this was done when the area was closed to skiers. East Slope and Rope Tow. To get the rope up the hill was no problem … it just lay on the ground. But to get it back down (as part of an endless loop), it had to travel in the air over some sort of pulley or wheel. Herb and the crew crafted tripods with old automobile axles and wheels mounted at the top. The rope would travel over these wheels on its return trip to the bottom of the hill. 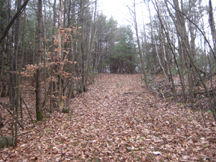 Having made the acquaintance of Bill Currier of New Ipswich, NH, Herb arranged for the purchase of the tow rope. Bill and his team brought the rope and spliced it into the continuous loop that was needed. The original hemp rope would expand and contract with the temperature and moisture so a tensioning wheel system was built behind the engine house. The operator would use a windlass to either take up slack or let it out as the rope conditions dictated. 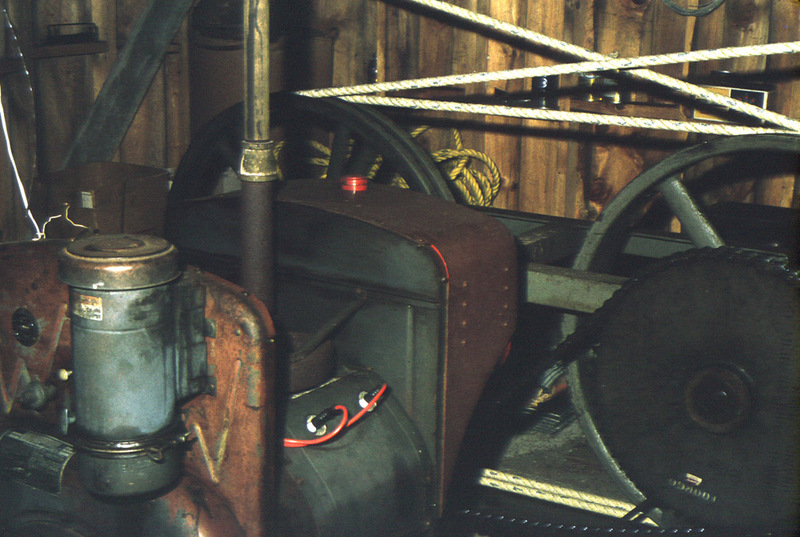 The operator would also wind up shoveling snow (or slush) out of the engine house periodically since it would fly off of the rope as it went around the sheaves. 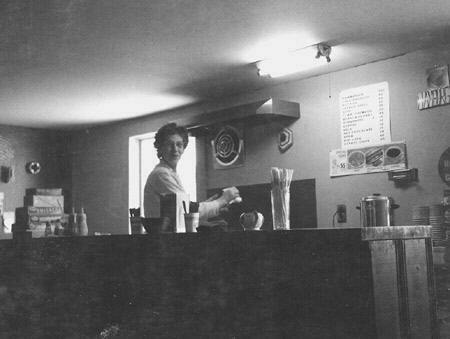 Doris at the snack bar, 1962. 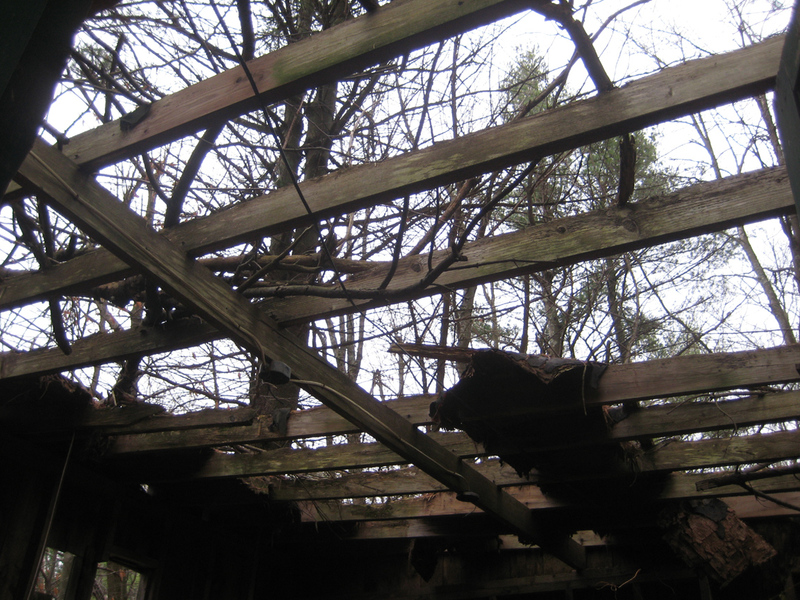 To make a warming hut and snack bar, the rear portion of the garage was cleaned out. 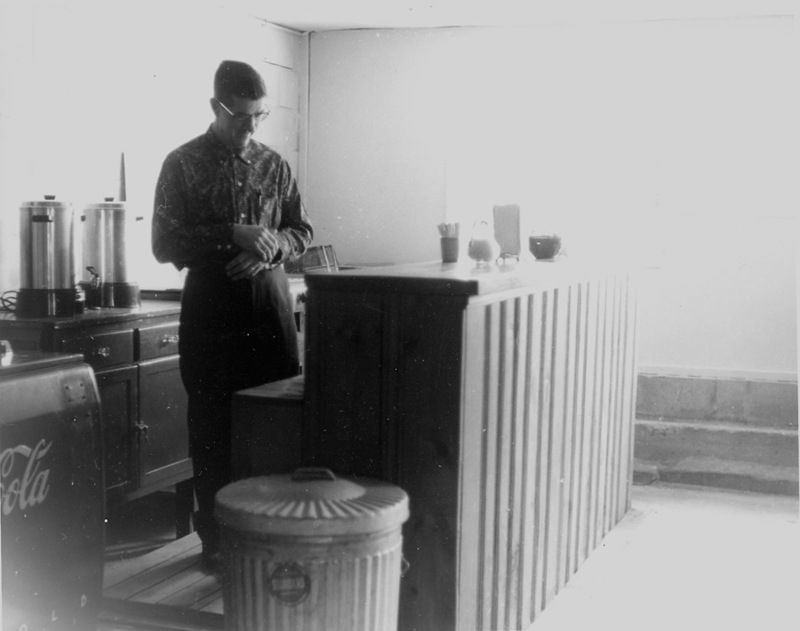 A pot-belly stove was installed for heat and a coal bin built outside the entrance. 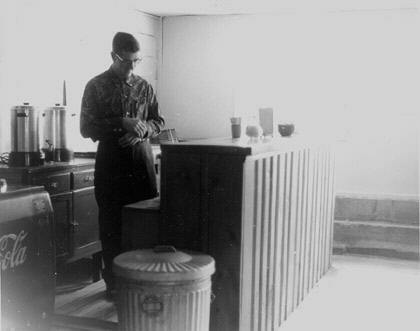 A counter was built and equipped with a coffee-maker, grill deep fryer, and hot soup maker (Campbell’s ... of course). There were also other items that patrons might wish to purchase. A Coca-Cola ice chest was there for bottles of soda … Coca-cola, orange, Sprite, and grape were offered for sale. 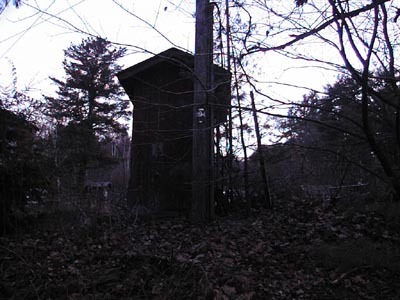 Since we had no way at that time to get running water from the house to the warming hut, a two-holer outhouse was built on the hillside above the parking lot. While not the warmest or the most accommodating of facilities, it met the need of the skiers. 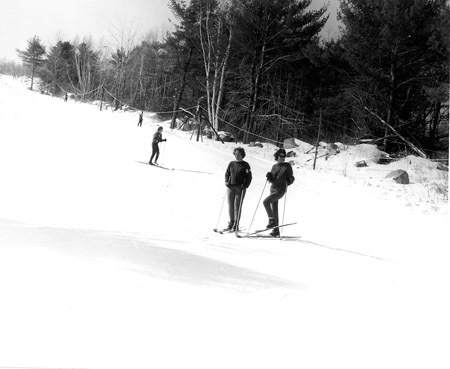 In January 1961, everything was ready for the start of the Ward Hill Ski Area. 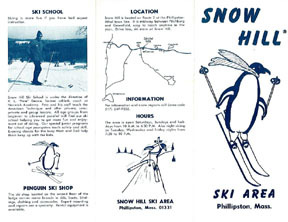 Ads were placed in the Athol Daily News and other local papers announcing the new place to ski “in your own backyard”. The area was open during the day on weekends and holidays. One of the first challenges was to pack the snow so that people could ski. While powder skiing was the thing in the Rockies, Eastern slopes did not have that depth of snow and relied on a packed surface for skiing. To solve that problem, word was circulated that the first skiers who showed up after a snow storm would get free skiing. They side-stepped up the tow trail while our engine operator, Dave Allen, walked up to the engine house. Once at the top, they would sidestep down to the bottom. Once there, the rope tow would be running to tow them to the top. This would be repeated until the slope was packed and we could open for business. Two seasons of this method was enough for us to move to a mechanized method of packing the snow. 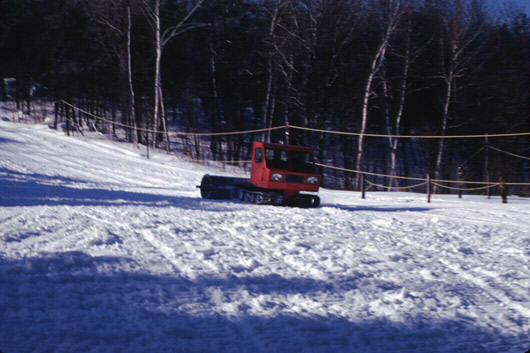 For the 1962/1963 season, a new “snowmobile” was purchased to handle this chore, a bright red Polaris from Roseau, Minn. It was the same as had been used for some of the polar expeditions and I can see why they might have had problems. The frame on which the track was mounted was entirely rigid which means that every mogul that was crossed produced a terrible shudder to the frame because it could not flex. We constantly had problem with the track and frame. The engine was mounted on the rear which meant that every time the Polaris lost forward momentum, it could easily dig itself into a pit due to its heavy end. In this photo, Wayne is towing a spring harrow (farm equipment) to break up the icy surface. The family was kept busy as the popularity of the ski area grew. Herb knew that a business flourished by adding more incentives to keep the regulars coming and to entice new skiers. 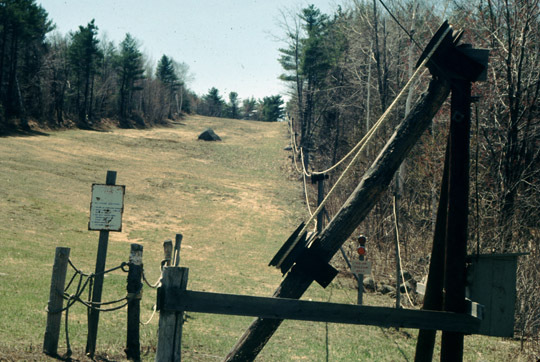 In 1962, a trail was bulldozed from the top to the west of the East Slope, terminating at the base of the rope tow. Lights were added so that night skiing was possible on Wednesday thru Saturday nights. On Saturdays, the area would close between 4:30 and 7:00 PM so that the family could have its dinner and regroup for the evening’s activities. Later on, it was decided that Saturday night skiing would be halted. Too many people were being injured when they came back for the evening since they were already tired from experiencing a full day of skiing. Evening hours were adjusted to Tuesday, Wednesday, and Friday nights in accordance with skier interest. 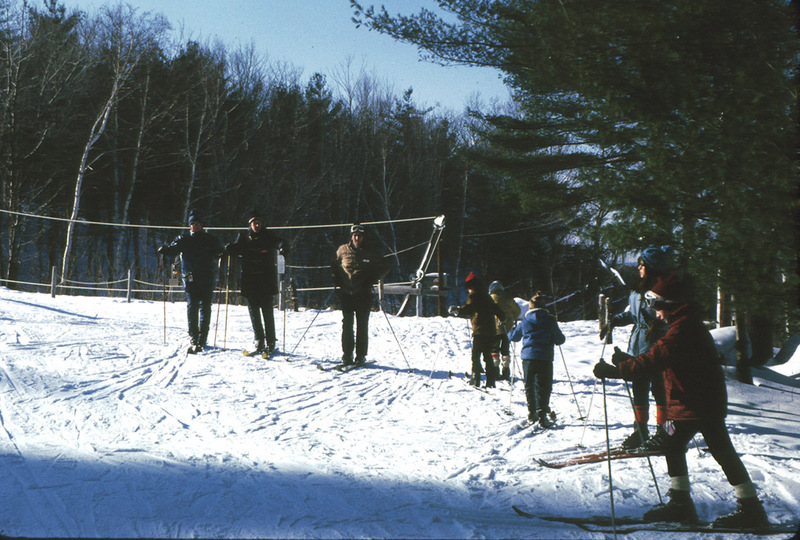 Ski School Lessons with Pete Deane, 1971. Constructing the lodge, 1963. While the warming hut was nice, it didn’t fit the style of a growing business. Plans were drafted for a major addition – the Lodge. It would have an expanded eating area, a ski shop ... and indoor bathrooms! In the summer of 1963, construction began. Since there was an abundance of stone, the lower level had a beautiful stone facade added to the existing concrete retaining wall. In the corner of the room, a fireplace was added. The mason, who was very good, was a rather rotund man. After the mantel was carefully leveled in place, the mason continued the stonework above it. After the mortar had set, it was discovered that the mantel sloped downward ... caused by the mason’s belly resting on it as he laid the other stones. Herb was not pleased! Howard was once again busy with the Lodge. 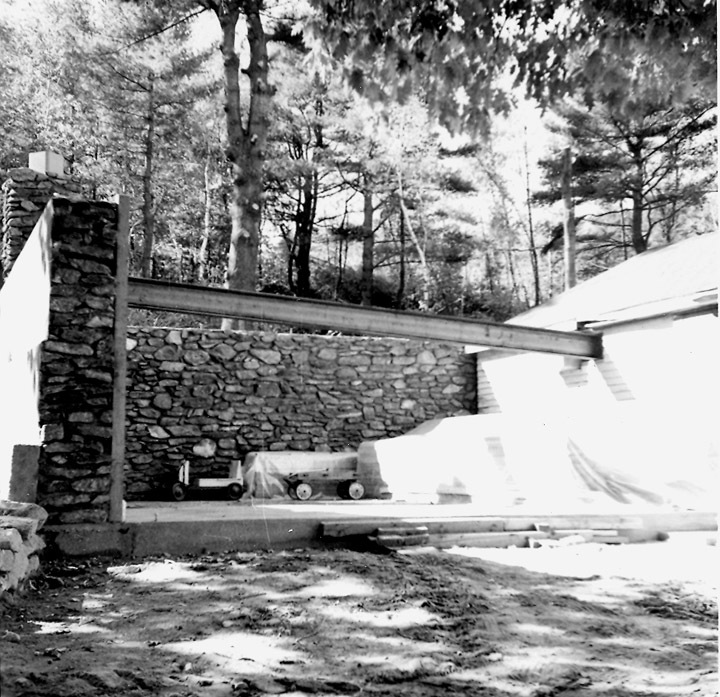 His tractor helped set the I-beam in place that would carry the weight of the second story above the stone room. The lodge quickly took shape and was ready well before the ski season started. The only problem that took considerable time to resolve was a persistent roof leak around the chimney. It took numerous changes in the flashing before the seam was watertight. 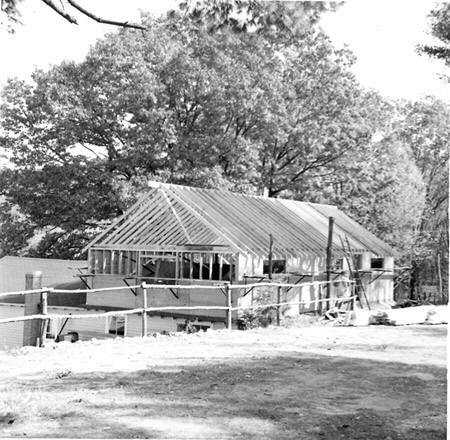 Constructing the lodge, 1963. View from the parking lot. Newly constructed lodge - simple snack bar, 1963. Also that summer, the west trail was widened into the West Slope. This time, the trees were felled for firewood (to be used in the stone room fireplace) so only the stumps and rocks would have to be bulldozed to the sides of the slope. All the brush from the felled trees was piled and burned. One afternoon after all the fires seemed to be dying out, the crew retired to the garage at the house. Just as everyone was getting ready to leave, someone noticed what appeared to be a lot of smoke from what should have been a dying fire. Everyone ran back up the hill except for two people who filled a 55 gallon drum in the back of the Jeep. Of course, the one fire that had jumped out of its confines had to be at the top. With a lot of effort, the fire was contained before having to call the Fire Department. They would not have been pleased to have had the start of a major forest fire on their hands. While the West Slope was being added, a new trail was cut ... the Chute. It started in the middle of the trail connecting the East and West slopes and exited to the West slope about a third of the way down. It was fairly steep at the top so it gave skiers a good run down the narrow trail. The trail passed close by to one of the huge boulders that the retreating glacier had dropped onto the hill. As young kids, Wayne and Doug viewed it as the size of a small house. 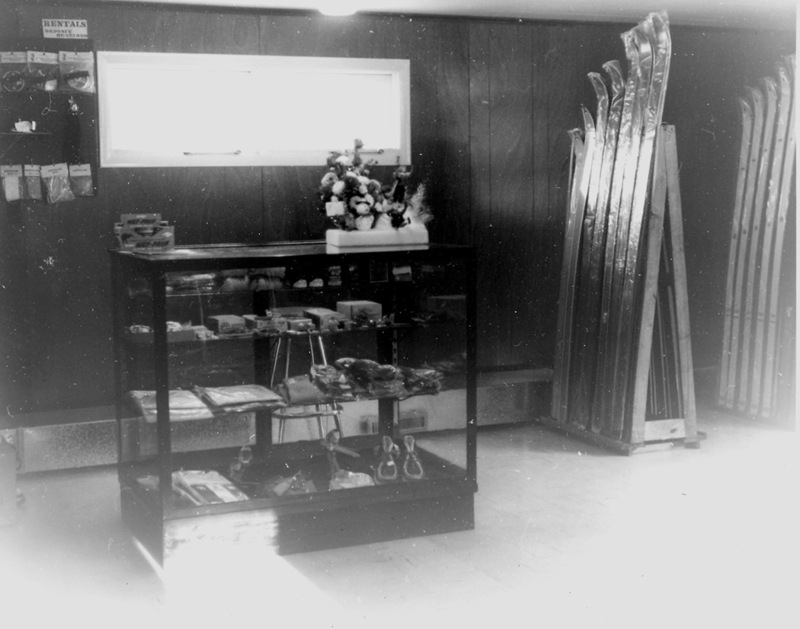 Ski shop in the lodge, 1963. 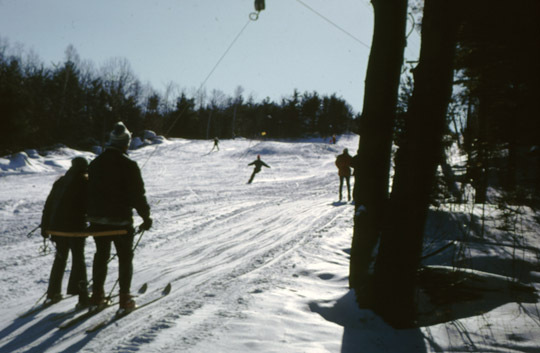 Rope Tow on West Slope, 1972. To get skiers to the top of the West Slope, a new rope tow was added. Constructing slopes and trails were not without hazard. One large boulder rested near a steeper part of the slope when the bulldozer was clearing the ground. Rather than risking it getting loose in our efforts to move it to the side of the slope and thus have it roll down the hill to Route 2 or crash into our well house at the bottom, it was decided to leave it in place. A more common hazard was ground hornets. Many a time one of the workers would step too close to a nest while cutting trees or brush and get stung once or twice. One instance involved two people getting stung … 15 minutes apart. After the first worker got stung, several people went back to the house to have the sting treated. Only after that was taken care of did the second person (Doug) get stung. It turns out that a hornet was under his shirt. The hornet let loose only when the shirt tightened against the hornet when Doug bent over to go from the breezeway to the backyard. There were other occasions of injury while performing maintenance on the ski area. 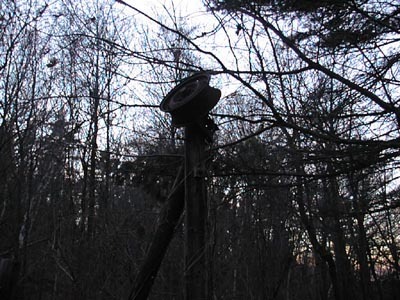 Once while replacing the jack pole on one of the tripods, the pole slipped out from its pocket and the whole tripod fell backwards towards the two people tightening the guy wire to the rear post. Only a quick leap prevented Doug from being seriously injured by the axle hitting his spine. A trip to the hospital was still required to get eight stitches to close the gash in his back. 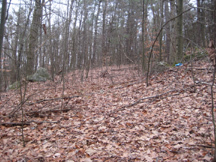 A more serious accident occurred when Herb was scooping dirt to fill holes on the slope. As the bucket loader raised its load, the tractor tipped over. While there were no broken bones, Herb spent a couple of days recovering at the Athol Memorial Hospital. 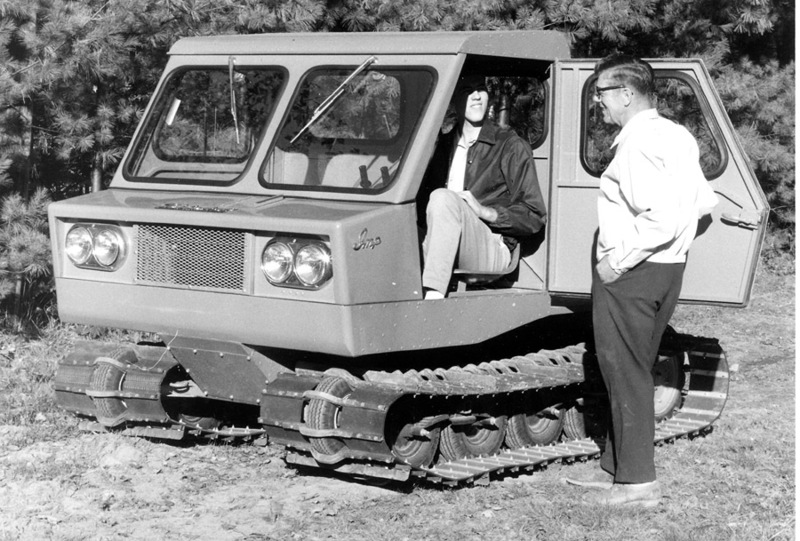 In 1965, we acquired a new snowmobile, a Johnson Ski-Doo. It had a rubber track with sprung-wheels for a smoother ride and more effective packing of the snow. The engine was mounted under a cowl in the front so you had some degree heat when riding it. Since it was much faster then the Polaris, the added speed created more “wind-chill” so you felt the cold quicker. Going up and down the slopes, round and round between the East and West slopes was boring and numbing. On really cold days, you could stay out for about an hour before coming in to thaw out. But once you were warm, you seemed to have less “resistance” to the cold and could only stay out 40 minutes the next time. Packing the entire area would take 3 to 4 ½ hours depending on the depth of the new fallen snow. 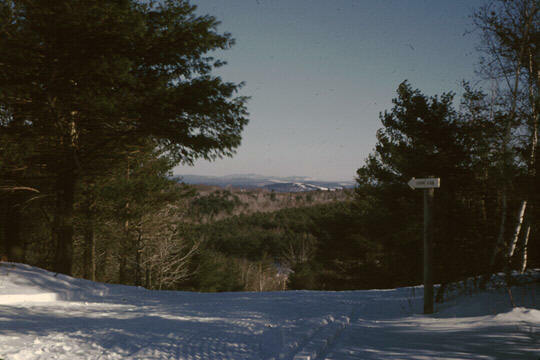 Around 1968, a letter arrived from another Ward Hill Ski Area. 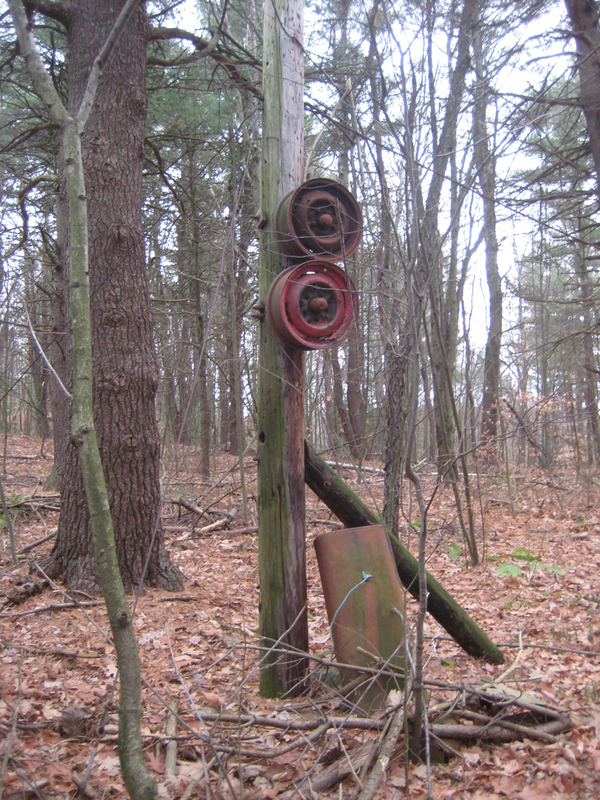 This one was located outside of Worcester, Massachusetts in the town of Shrewsbury. As our area grew in size, we started to advertise in the Worcester and Boston newspapers. Obviously the other Ward Hill folks had seen our ad and it was causing confusion for their customers. The letter advised us that we were using their name and we should cease and desist or they would bring legal action. In 1960, when Herb chose the name of the ski area, he used the geographic name of the hill. Before the days of the Internet, it was not easy to find out if a name was already in use. 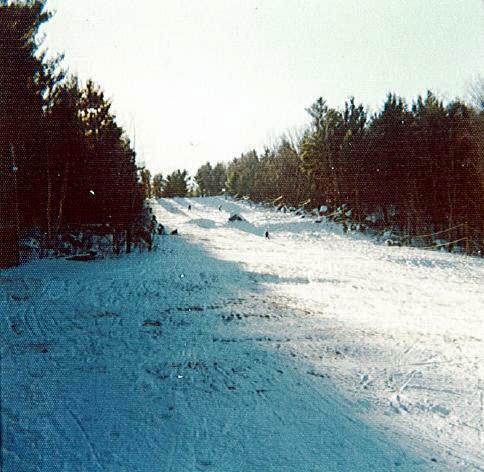 The other Ward Hill Ski Area was located on Union Hill. 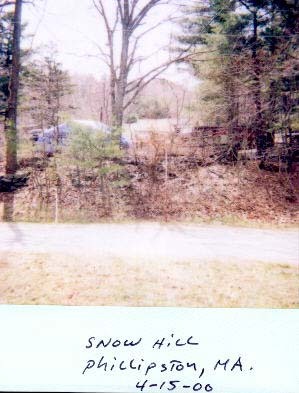 After discussions between the owners, it was decided that our ski area would now be called Snow Hill. The Thunderbolt Trail, looking towards Baldwin Hill. 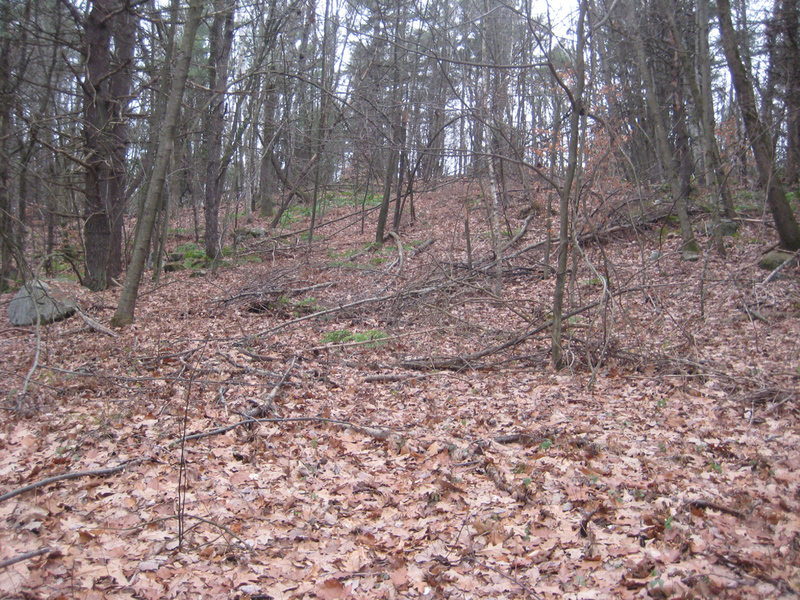 The only additions to the East slope were two trails, the Thunderbolt and the Snow Fall. They started separately from the top of the hill and then joined for a common exit about two-thirds of the way down the East slope. The Thunderbolt had a bold downward gradient before leveling out to join the East slope. The Snow Fall started out gradually before steeply sloping to join the Thunderbolt. Top of the Snow Fall trail. 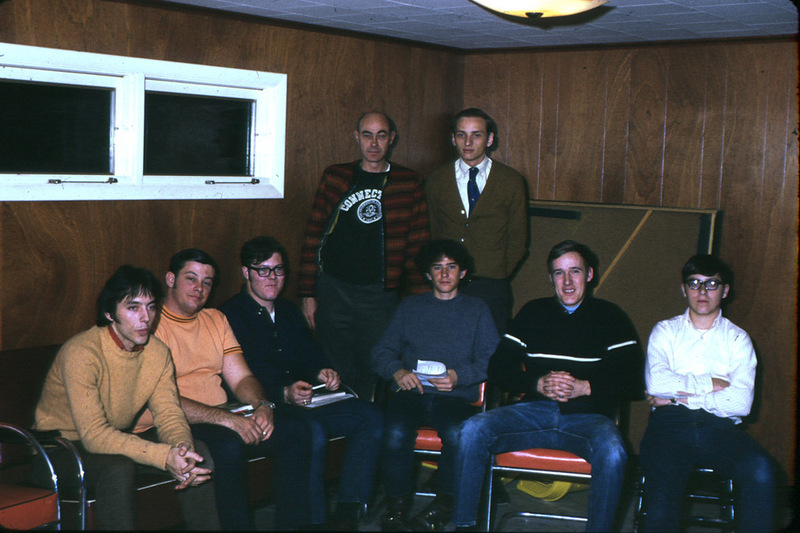 Members of the Ski Patrol, December, 1970. For those unfortunate skiers who fell or otherwise injured themselves, we had a contingent of Ski Patrol members, all of them were certified by the National Ski Patrol Association. In the early days, we had only our family toboggan with a rope in the front and a rope in the back end. It was not necessarily the most comfortable or comforting experience to be brought down the slope after an accident. The injured skier would be brought across the parking lot and into the lodge. 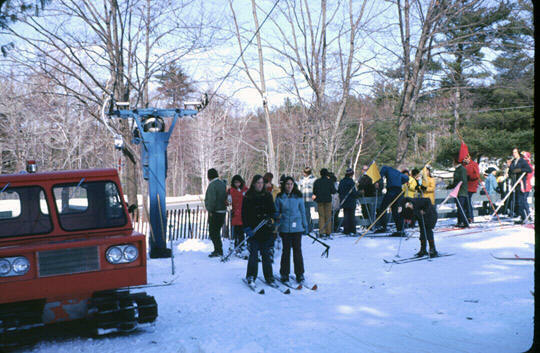 Since there was not official ambulance service in Phillipston, most injured skiers were transported to Athol Memorial Hospital by the car of the family or friend. 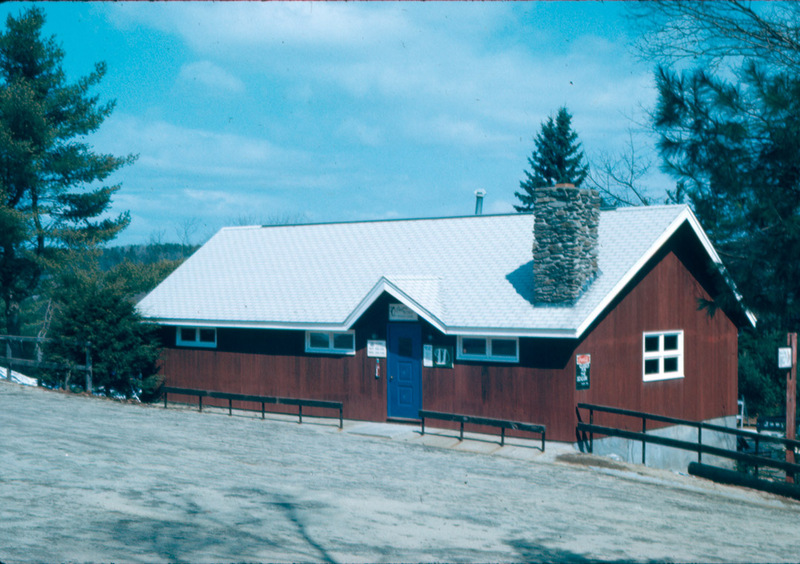 In later years, a separate Ski Patrol Hut was constructed at the end of the parking lot next to the East Slope. Of course, building the new patrol hut was itself not without injury. While nailing studs for the walls, the head of Doug’s hammer flew off, striking Dave Allen in the head. Luckily for Dave, a lump and headache were all that resulted. 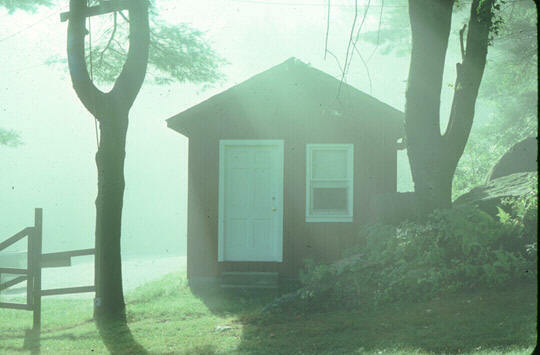 Safety Patrol Hut in the fog, 1974. 1967 - Doug and his father with the Imp. It became increasing evident that packing the snow with the snowmobile was not fast enough nor did it have the horsepower to do other tasks (ice breakup, etc.). 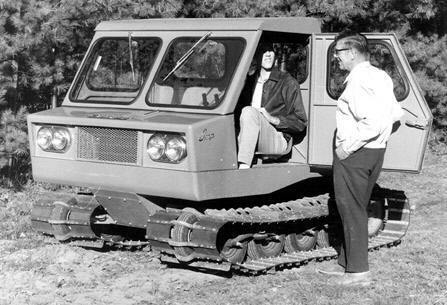 While the Sno-Cats were the preferred snow grooming machinery of the big ski areas, their cost was more than our budget would allow. In 1967, a visit was made to the local Thiokol dealer to arrange the purchase of one of the small but effective units called the “Imp”. With an enclosed cab and a cab-forward engine, packing snow was now possible in shirt-sleeves no matter the weather. The open deck on the back made it easy to get gas and other supplies to the top of the hill. The Imp was also used periodically to bring injured skiers down the hill. While it was a more controlled decent, it was not necessarily a smooth ride due to the Imp’s tracked treads. The Imp with roller, West Slope, Feb 1971. 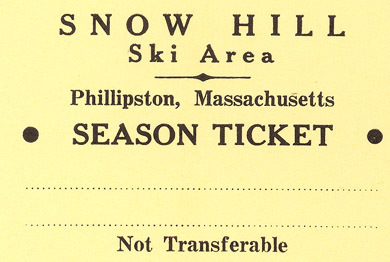 Snow Hill Season Ticket. As the popularity of the ski area grew, more parking was needed. The state did not appreciate cars parking on the exit ramp of Route 2 that ran by our house so a new parking lot was added in the summer of 1968. Once again, Clarkie was brought in to push rocks and stumps and smooth the lot. During the felling of one large maple tree, it got away from the crew and fell towards Ward Hill Road instead of into the woods. It bounced several times into the power lines and the many individual telephone wires (before the days of bundled cables for phones). No damage was done other than having to call Massachusetts Electric to come reset the circuit breakers on the line at the bottom of the hill and to apologize to the Welsh family, our sole neighbor at the top of the hill. When we had winters with good snowfall, keeping ahead of the snow in the parking lots was almost as taxing as packing it on the slopes and trails. On the slopes, it was just a matter of packing the new snow onto the old. In the parking lots, no matter how you tried, the available space kept getting smaller and smaller no matter how hard you tried to pack the new snow into the existing piles. More often than not, in an effort to push snow higher on a pile, the plow would hang up and you’d have to dig out the snow from underneath the plow. When there were no further options, Clarkie would be called to the rescue. He would come with his bucket loader to lift the snow higher and further back onto the piles. The area’s biggest single project was the 1969 installation of the t-bar lift. After talking with several other ski areas, a Doppelmayr unit was selected for purchase. It was manufactured in Wolfurt, Austria, loaded in a shipping container and shipped across the Atlantic. To prepare for the arrival of the lift, the East Slope Engine House was loaded on Howard Clark’s trailer and brought to the base of the hill to serve as the garage for the Imp. Howard also dug large holes for the base and summit stations as well as the three towers on the slope. 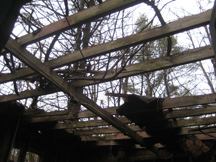 In those holes, we constructed cages of reinforcing bars and built wooden forms around them. 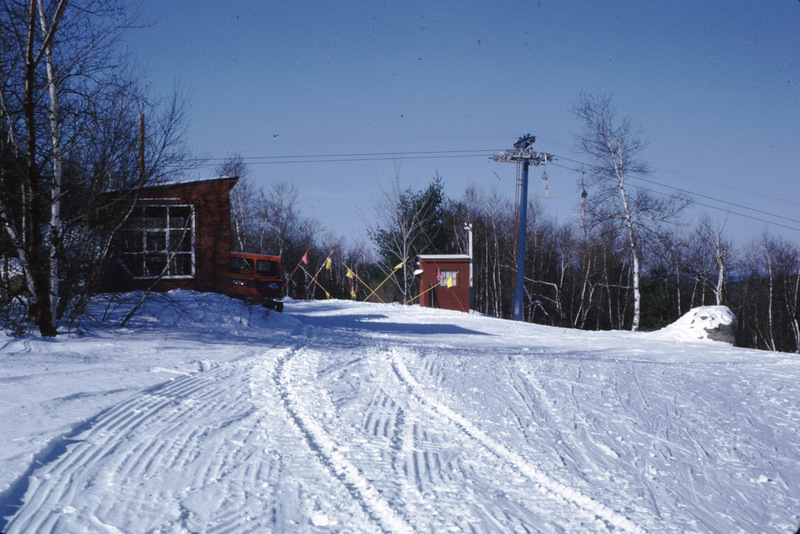 Base of the T-bar with the Imp, February 1971. T-bar on the East Slope, January, 1971. Once all the forms were constructed, Reading Concrete filled the forms with tons of concrete. Getting the trucks up the hill was a challenge. If they were full and drove forward up the hill, the concrete would spill out the back of the drum. So partial loads were ordered and the trucks backed up the hill. The pouring of the concrete went well except for the reversing station base. Because of the huge amount of weight that would be exerted by the downhill run of cable, the form was a huge four foot square box that was probably 15 feet long. About halfway through pouring concrete into the box, one end popped up and concrete spilled into the woods. After repairing the form, Reading continued to fill the form while several of us shoveled the spilled concrete up over the top of the form. Since there was only the calculated amount of concrete on the truck, every shovelful of spilled concrete was needed to fill the entire form. The towers were pulled upright into sockets in their concrete base using Howard’s tractor and then backfilled with concrete. 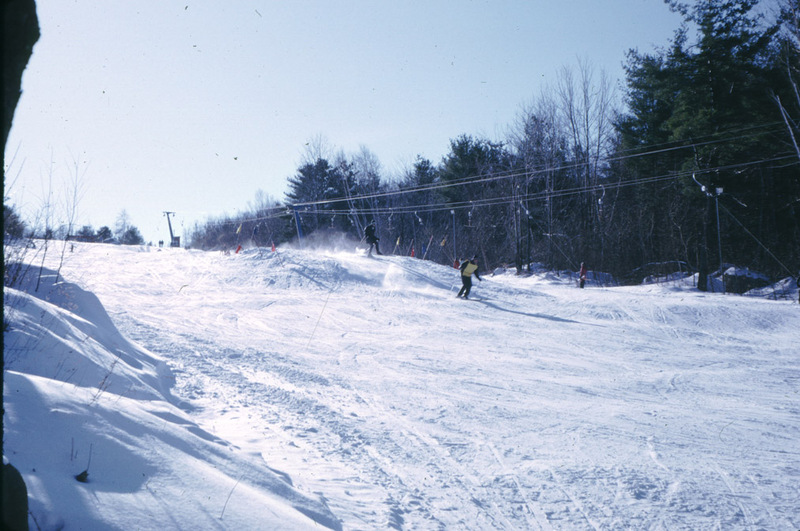 Top of the West Slope/T-Bar, and the Imp, January 1971. 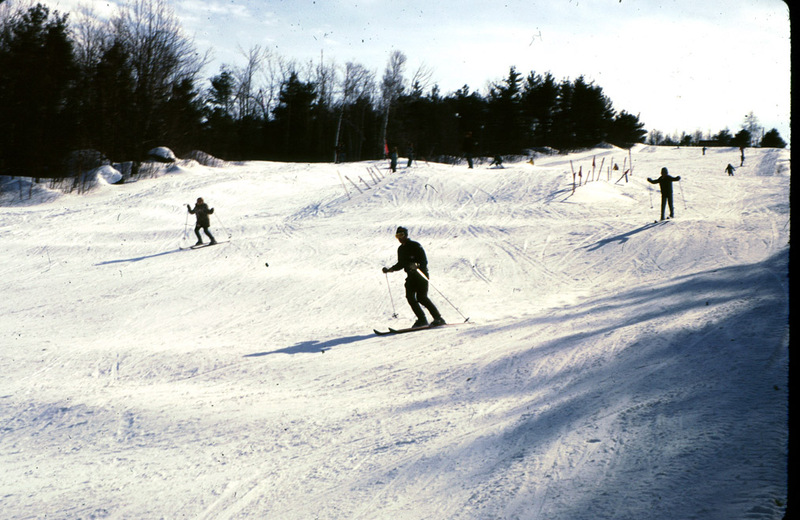 Riding up the T-bar, January 1971. 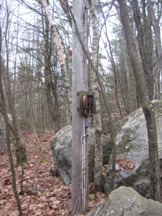 Once all the towers were in place, Walter Boyko and his brother from Mill Valley Splicing of Belchertown, MA came to rig and splice the wire hauling cable. The cable was laid out up and down the hill and then placed over the pulley assemblies on each tower and around the reversing station. Once it was in the proper place on all the pulleys and bull wheels, the task of winching the ends together and splicing began. It was an arduous task but the Boyko brothers knew their trade. Never once did we have a problem with the splice in all the years of operation. While all the rest of the work was going on, another task was undertaken … to build a summit house at the top of the East Slope. During a summer remodeling job on the house, large windows were removed from the front porch when it was converted into the office. These windows were incorporated into the Summit House. With its small stove, it was a place for the skiers to warm themselves and enjoy the view of Mt. Monadnock and the surrounding area. It was during this construction effort that we discovered gnawing on the legs of the ladder that has been left out overnight. It turns out that porcupines love salt and the salt from our hands was on the ladder. Such a treat for them! We later found that the material didn’t matter to them either. The next winter when we installed a closed circuit TV camera in the control booth at the top of the hill and laid the wire on top of the snow, they ate though the cable because the cable had been handled without gloves. Skiers on the East Slope, 1971. After all the positive events of the summer of 1969, the winter brought a major ice storm which shut down the area for many days. Typically when it would start icing, the plan of attack was to run the rope tow or t-bar every few hours to break the ice off the hauling rope and the T’s. This would occur all day and night until the storm passed. 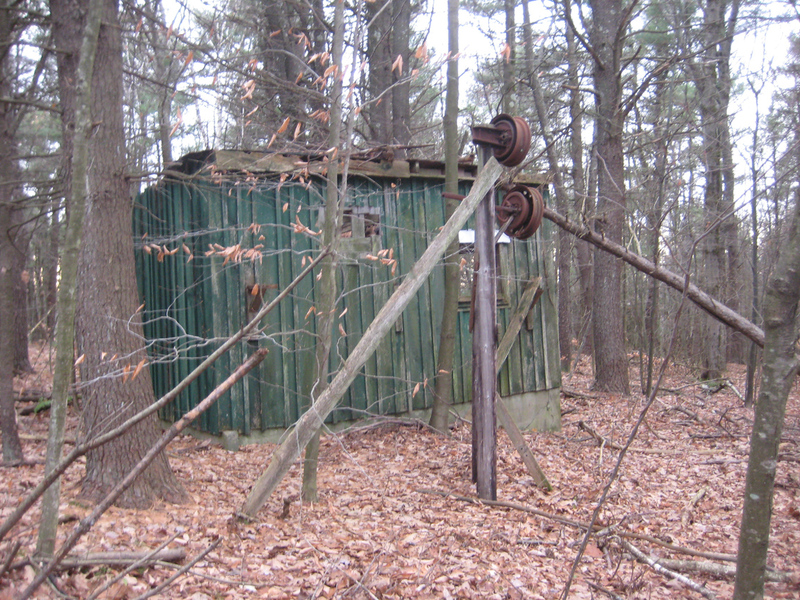 In 1969, the plan worked until we lost power from Massachusetts Electric. When the storm finally ended, the 1” hauling rope on the t-bar measured 3” in diameter with the ice that had accumulated. Being winter, there was no way that the ice would melt anytime soon. An extension ladder was mounted on the back of the Imp. The Imp slowly backed its way up the slope with frequent stops for the crew to whack away on the ice on the hauling rope and T’s. It took several more days of grooming the slopes to break up the ice before operations could resume. 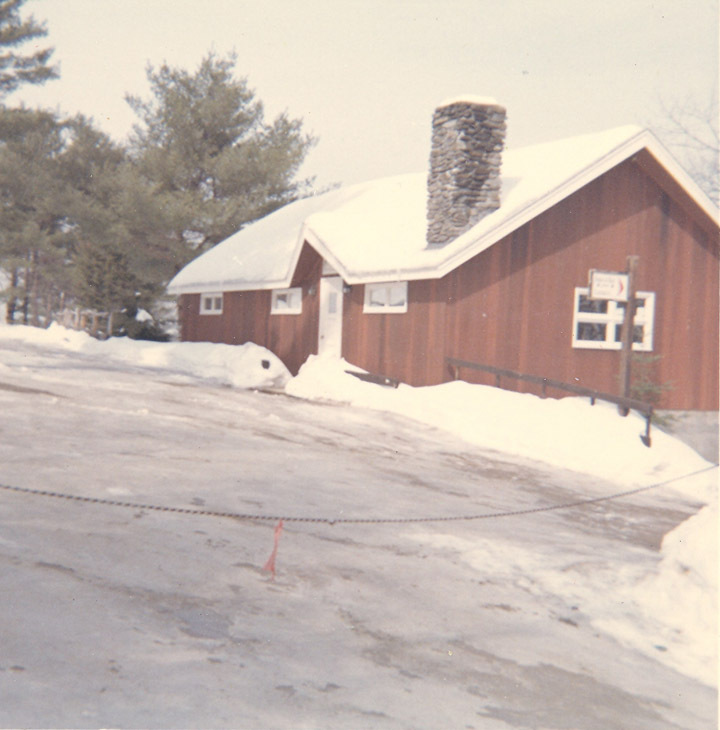 The Lodge, 1972. 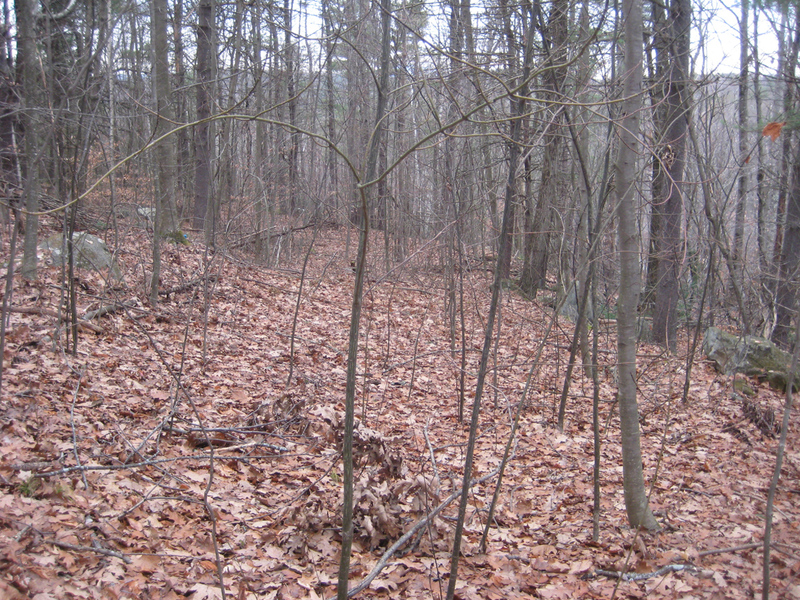 The last trail that was added was the Glade. 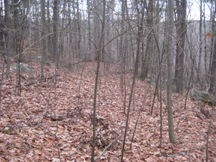 It was merely a trail through the woods that had many of the smaller trees and brush removed. Only when there was a lot of snow would the Glade be opened and only the more experienced skiers were to ski on it. It originally started by West Engine House, and ended at the bottom of the West Slope by the old spring well house. Skiers who didn’t gather enough momentum down through the hollow would have to climb up to the trail’s end. 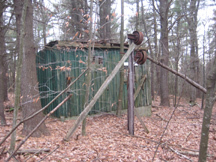 The year after it was opened, it was extended from one side of the connecting trail at the top of the hill to run around the back of the West Engine House to join the rest of the Glade. 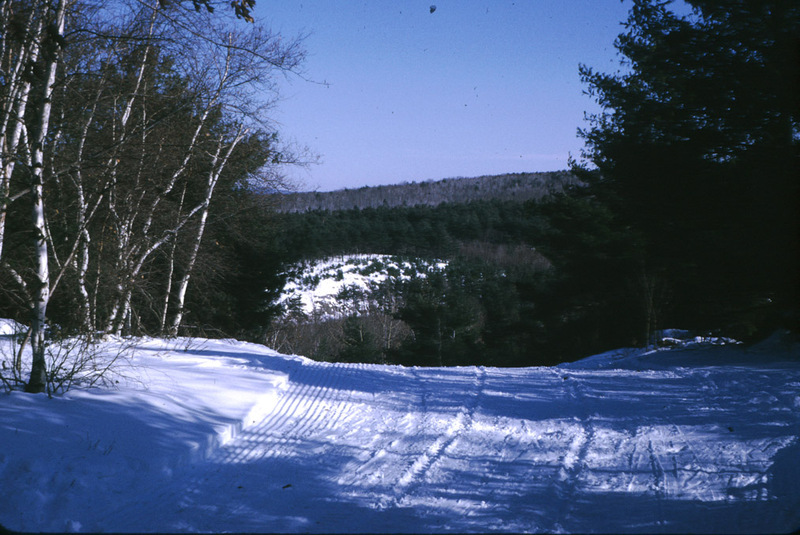 One of the last major improvements for Snow Hill was an expansion of the ski school area at the bottom of the West Slope and the addition of the Glade. 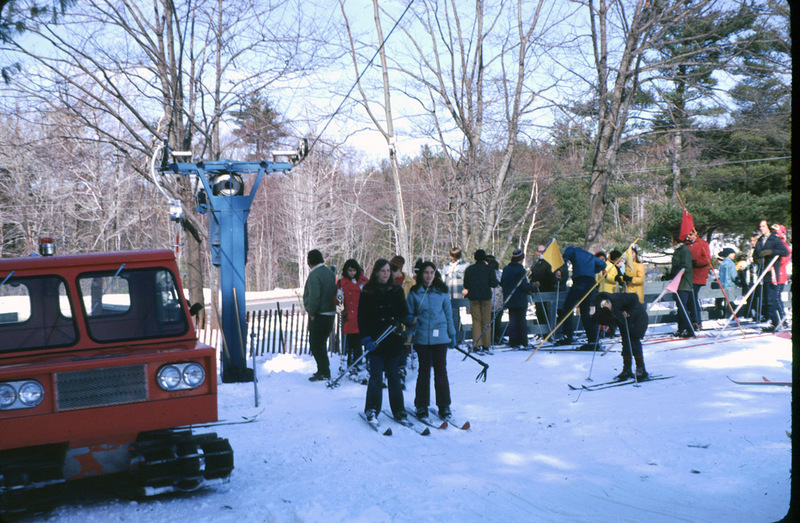 In 1973, a baby rope tow was added for the student’s use. Beginning students had to learn to side-step and herringbone their way up and down a slope, make controlled turns (and falls), and they needed to learn how to grip a moving rope. The baby tow was a perfect way to handle this last item. Since it was powered by an electric motor, it was easy for the instructor to start and stop during the class lesson. Trail map from a brochure provided by Deane Smith. -- Ski School area (bottom left of the West Slope). In 1979, it was decided that running the ski area was no longer a viable option for the Smiths. 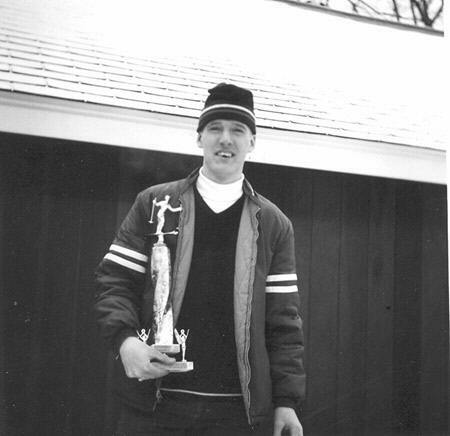 With both sons on their own (Wayne in 1965 and Doug in 1974), a series of mild winters with a decreasing number of snow storms, and Herb’s retirement from Starrett’s, it was decided to close the ski area. The t-bar was sold, dismantled, and moved to a small college in western Massachusetts. Other items that could be sold were removed from the slopes. Other things were just left in place. The West Engine House, its engine and sheaves, and assorted rope handling poles still stand. 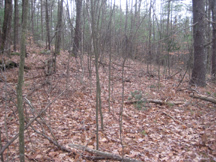 Wayne’s son Deane has hiked into the woods several times to view the structures and track the re-growth of the forest on the old slopes. 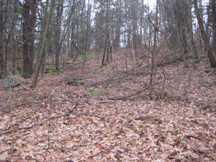 From Baldwin Hill, you can still make out the outlines of the two slopes due to the differing ages of the surrounding forest. The original yellow Smith-family house and a few acres on the lower hill were sold. The balance of the property was later sold to our good friends at Cycle Design. Their dream was to use the access road off of Ward Hill Road to have a house built at the top of the hill where the summit house stands. Herb and Doris designed and built a new house on the back-side of the hill on a lot on Secret Lake. With them moved a lot of memories and memorabilia of the 20 years of operating the ski area. 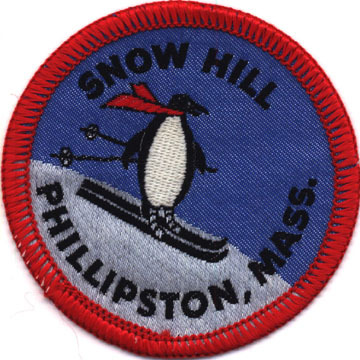 The house contained numerous penguin figurines, Snow Hill license plates, diagrams of the slope/trail layouts. 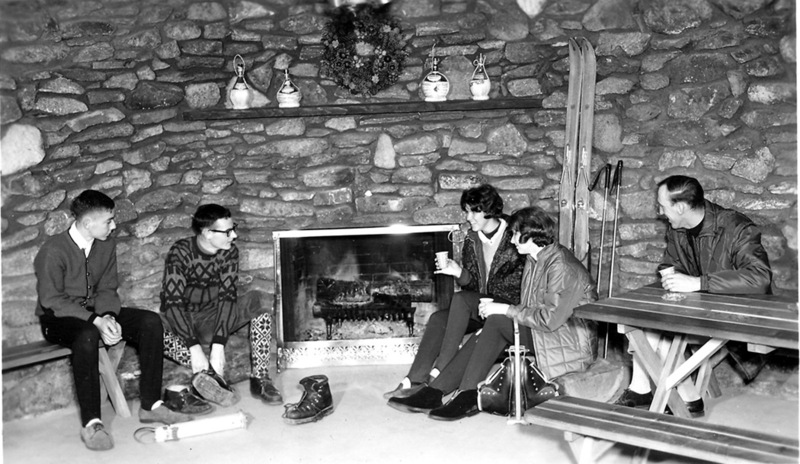 At family gatherings, the stories of the ski area were relived countless times. The old 8 mm or Super 8 movies or slides of the skiers or work around the area were shown from time to time. Doris died in 1998 and Herb in 2002. With them went many of the exact “who, what, and when” details of the ski area. 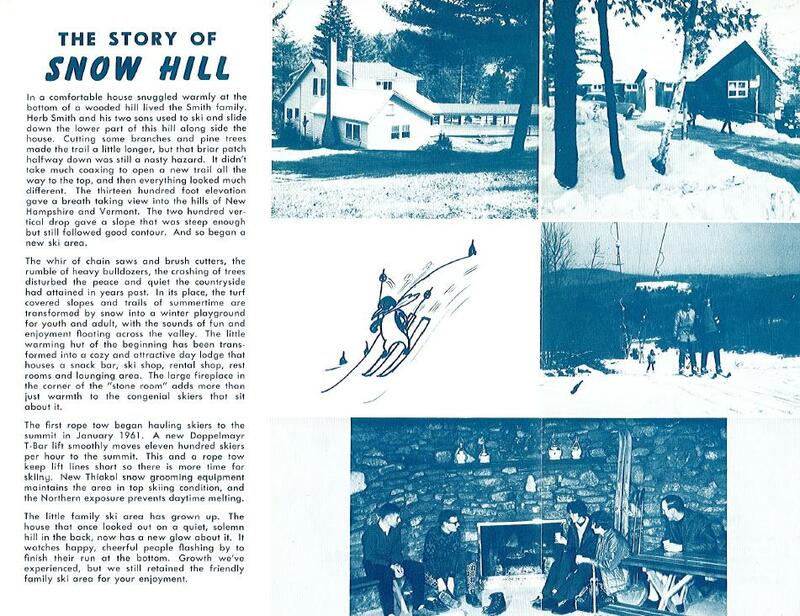 Now in 2008, this account is being written to capture as much information as possible about the Ward Hill / Snow Hill Ski Area, its history, stories, and pictures. 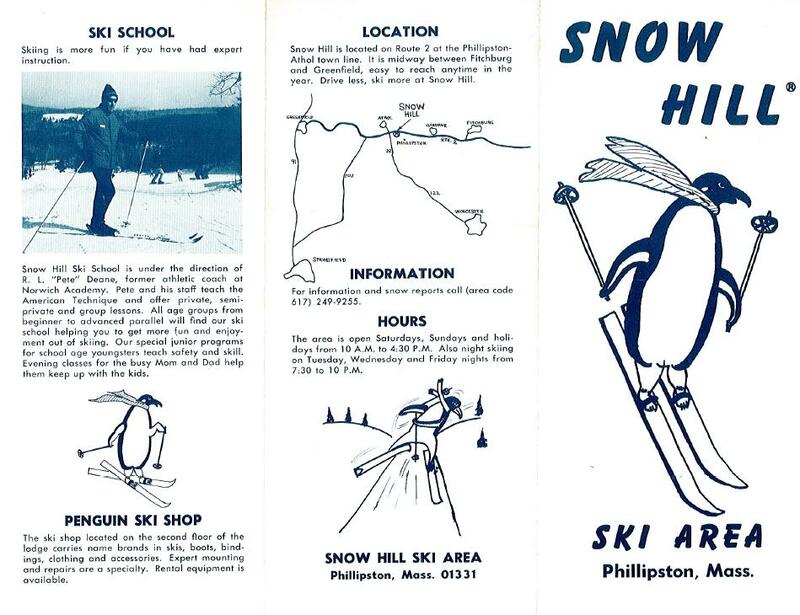 It is an effort to recount the events that started “in a comfortable house snuggled warmly at the bottom of a wooded hill.” The little family ski area grew up, provided a fun skiing experience for thousands of people during its time, and then slowly went back to being a quiet solemn hill in Phillipston. The “friendly family ski area” is no more. 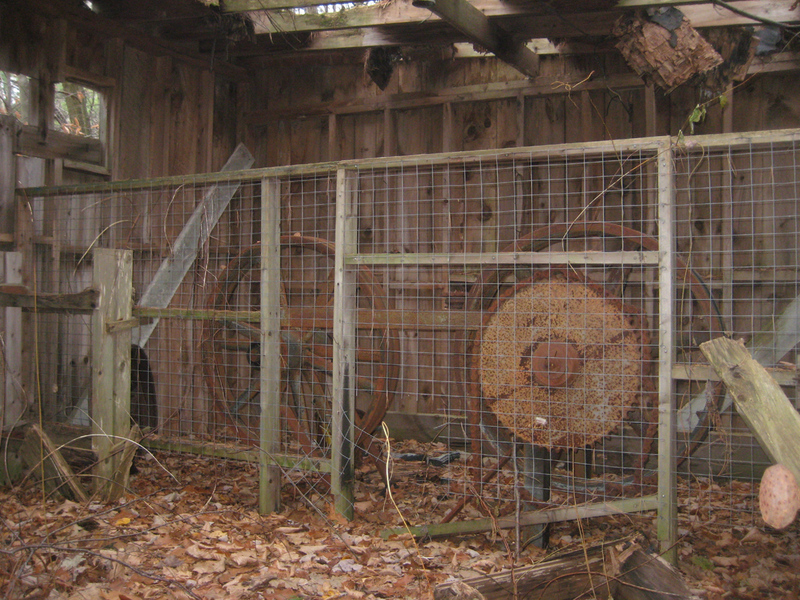 "My Grandparents operated it from 1961 until around 1980. It had a 200' vertical drop with 2 slopes and 5 trails. 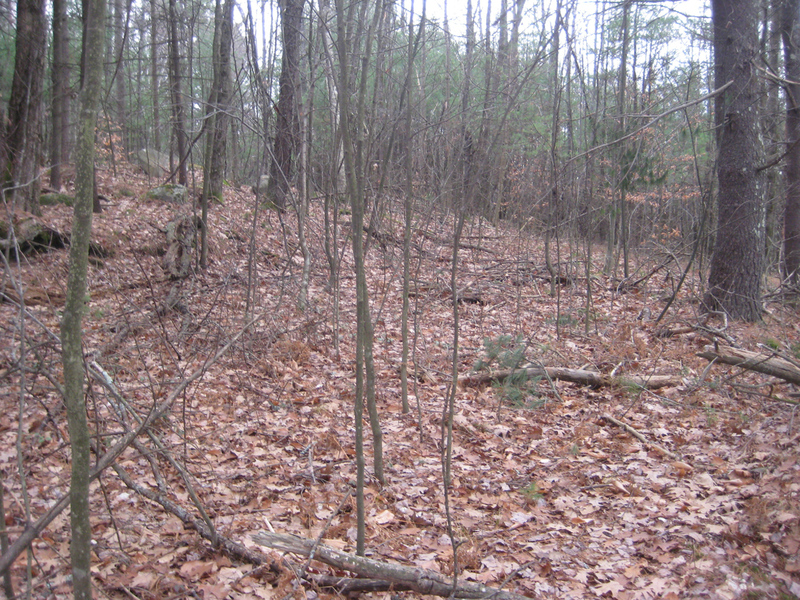 One of the trails was an exciting 1500' glade. The area was serviced by a 900' T-bar and 2 rope tows. The summit had an incredible view of Mt Monadnock and vicinity. 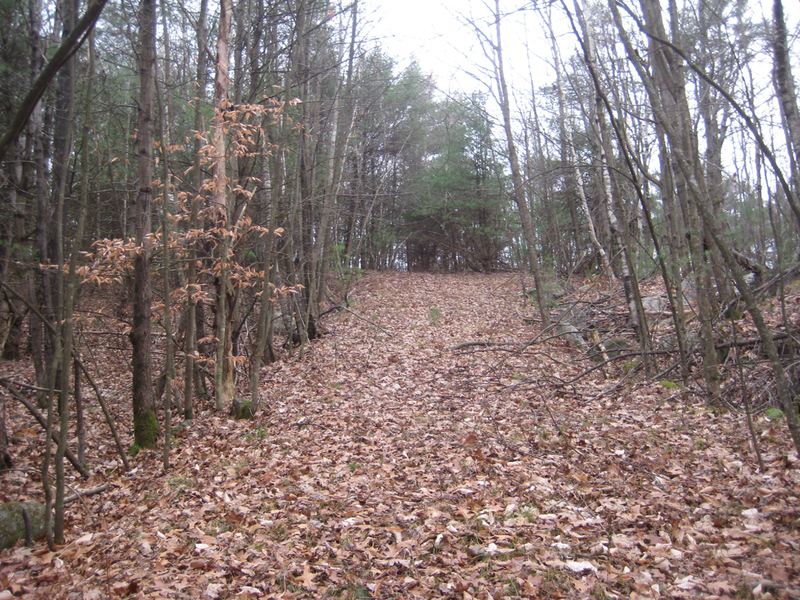 Now, the slopes are almost completely overgrown and the summit is planned for development. It's located right on Rt2. If you're headed Eastbound on Rt2, it's on the right hand side of the Athol/Phillipston Exit (before Ward Hill Road). You can still make out the East and West slopes." 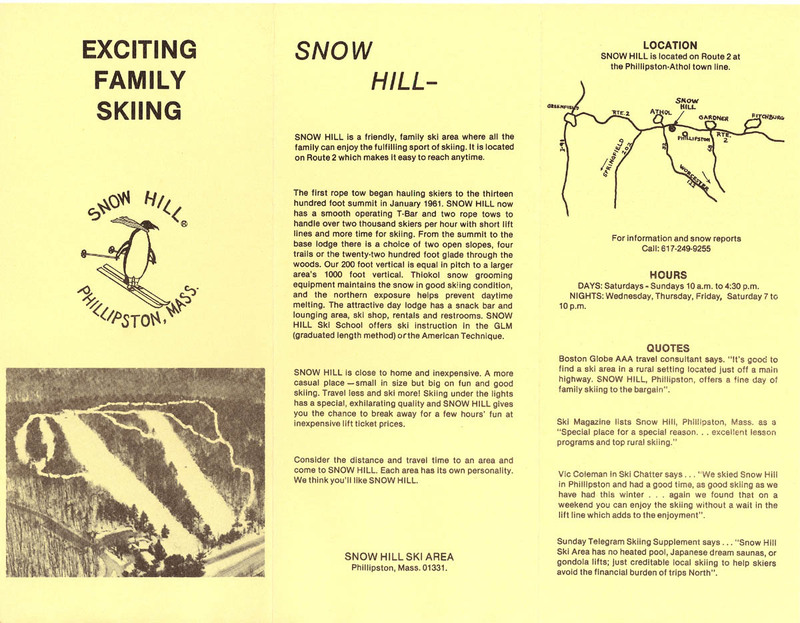 Doug and Deane Smith sent us scanned brochures of Snow Hill. Click on each for the larger version. The cover of a brochure, date unknown. Back of the brochure, telling the story of Snow Hill. Another brochure, showing the trail layout. 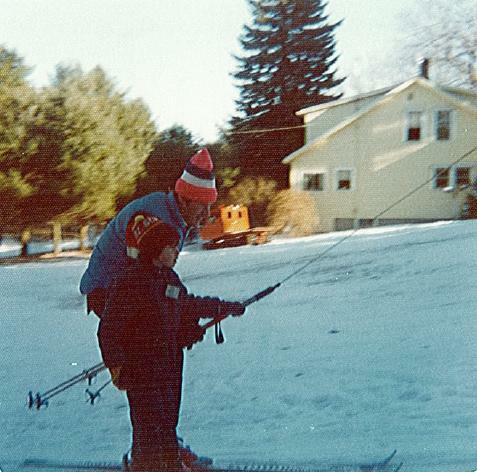 Deane Smith with instructor Steve Hastings riding the T-bar, February, 1977. Courtesy Deane Smith. One of the slopes, note rope tow on the right. Note the thin cover. 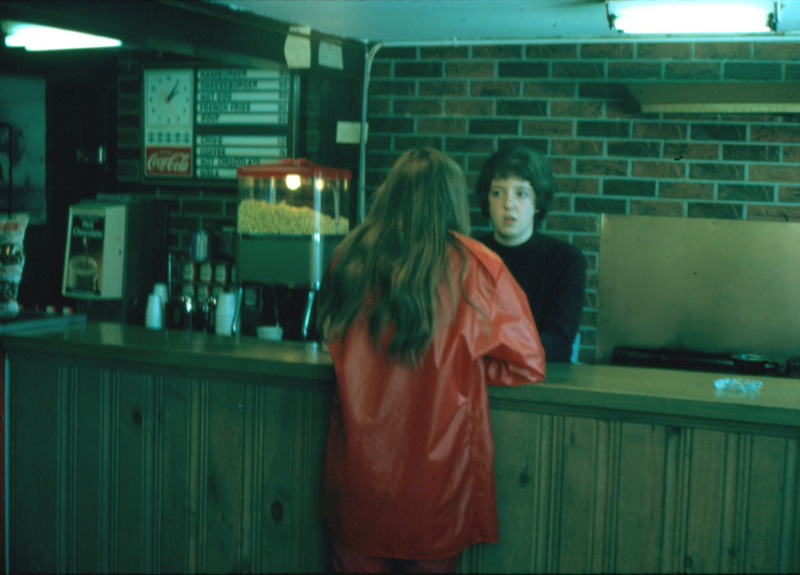 A view inside the snack bar, 1972. Courtesy Doug Smith. Steve Hastings, Head of the Ski Patrol. Lodge publicity photo, 1970. Courtesy Doug Smith. Here's the satellite view of Snow Hill in Phillipston. 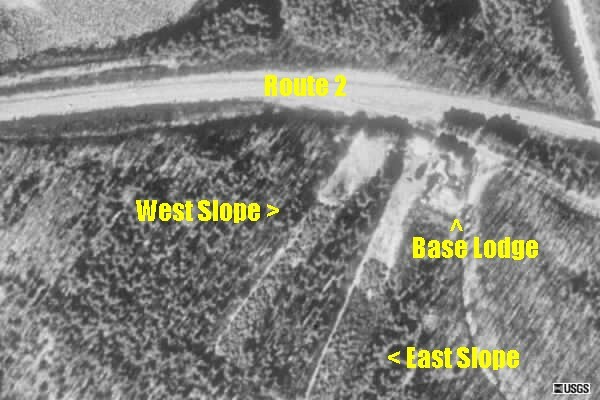 The slopes have been labeled as to what they are. According to Laurie P, the patrol toboggan and some of the first aid equipment went to Pine Ridge Ski Area in Barre, MA. A view of the base area. Photo by Brian O'Malley. 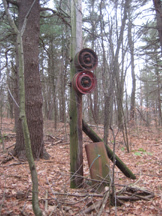 A view of the former rope tow pulley. 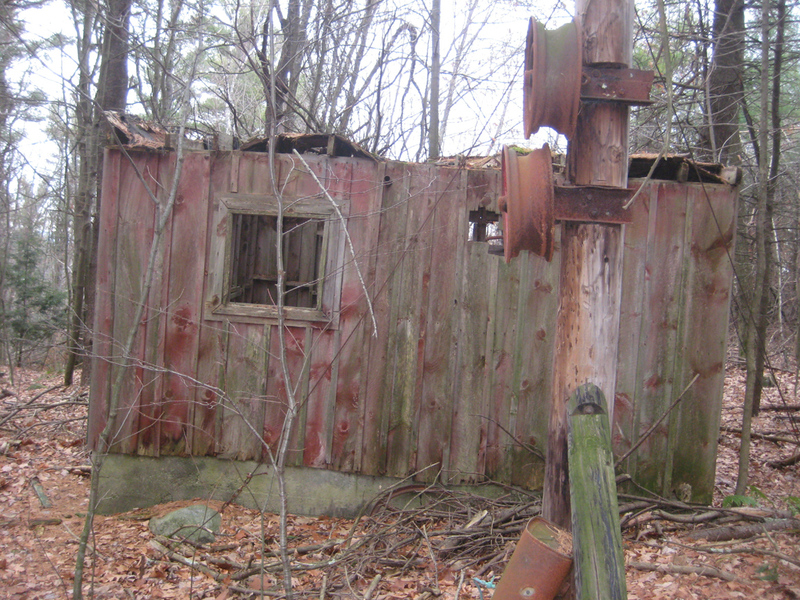 According to Doug Smith, this is the original ticket booth at the bottom of the East Slope. 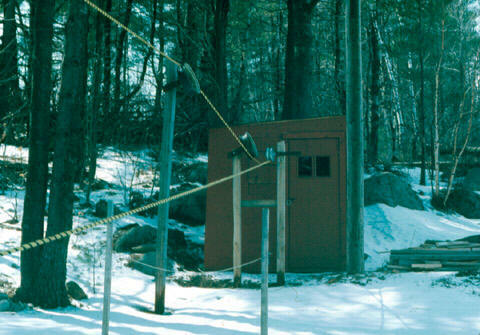 It served as the ticket booth until the T-bar was installed. 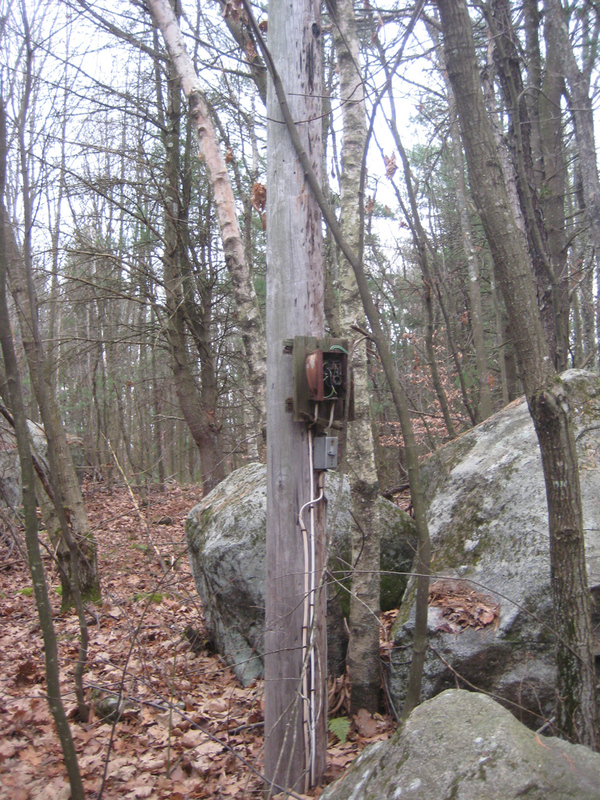 At that point, it was used to house the electrical panels for the lift, thus the telephone pole beside it. 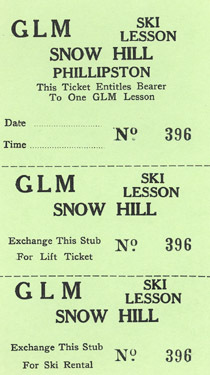 Lift tickets were then sold at the ski shop in the lodge. Jeremy visited the area in November, 2012, on a cold, cloudy day. 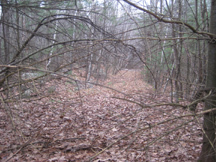 Most of the trails are overgrown, but are still detectable. The line lifts are still recognizable. While most of the rope tow towers are gone, the summit drive building is still standing, but probably not for much longer, as the roof has collapsed. Please click on all the photos for the larger version. Top of the Snow Fall trail. Lower Snow Fall. Junction of Snow Fall/Thunderbolt. 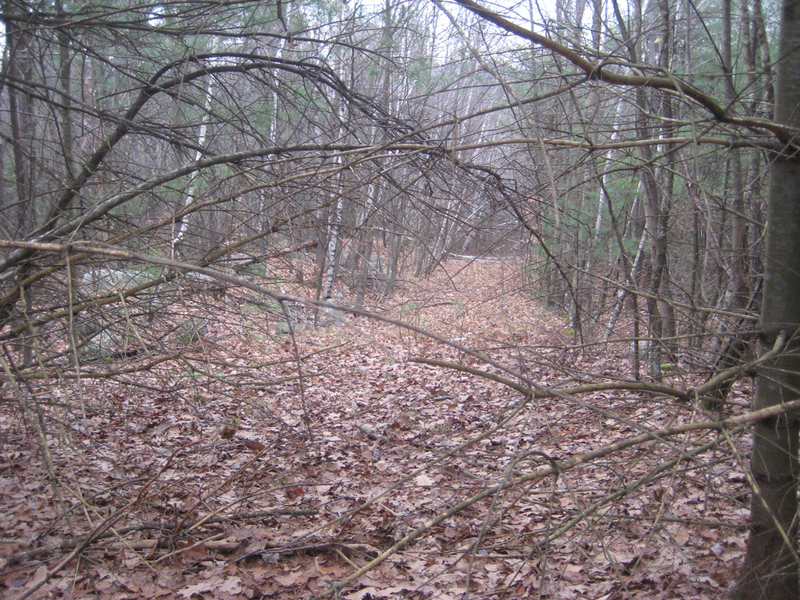 End of the Thunderbolt/Snow Fall trail, as it meets the East Slope Top of the rope tow line. West T-bar liftline, still somewhat clear. 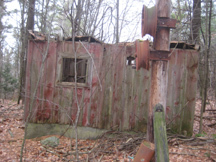 Rope tow drive building. Rear of building. Interior, showing engine and partially collapsed roof. View of the roof. Lift tower. Power tower. My parents, Doug Mulligan and Jayma Wilkins (referenced as "our friends at Cycle Design" in the write-up), are the proud owners of the Ward Hill land above the ski lodge/house, upwards to the summit. We were very close friends of the Deans, especially Herb, and I feel he would want us to mention that visitors are more than welcome to visit our land. 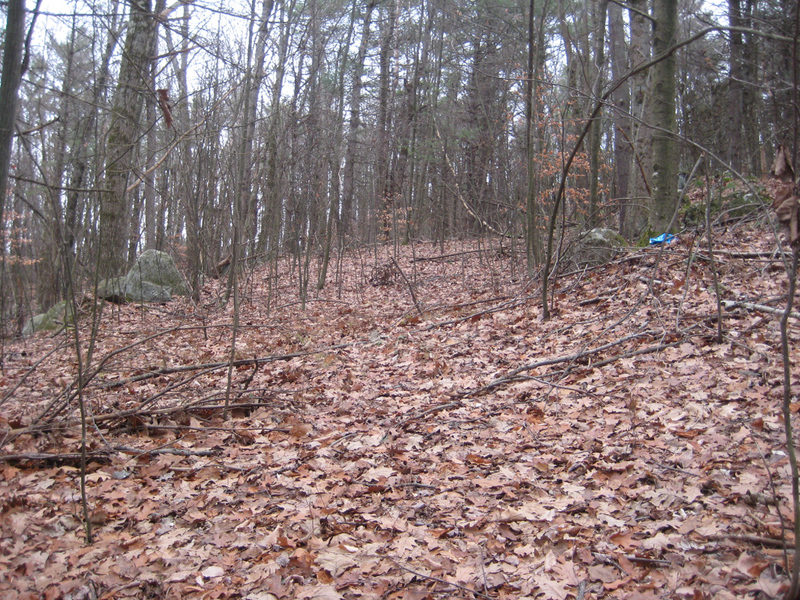 Hikers can park on the right-hand side of Ward Hill Rd, past the lodge, and access the land from there. The former Smith homestead is a separate parcel, and was auctioned off to a private investor a year ago. 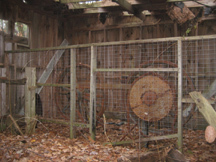 Although no one appears to occupy the house, we ask visitors to refrain from entering this property (where the yard begins), especially as the buildings appear unsafe. 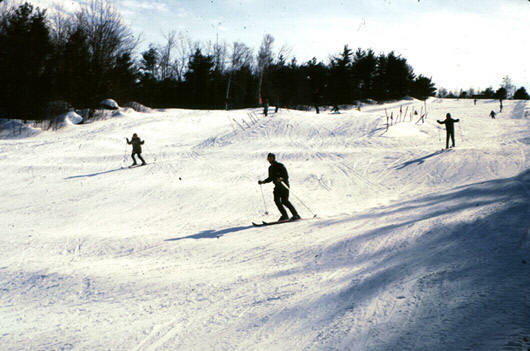 Otherwise, responsible visitors are encouraged to see Phillipston's only ski area- it's quite a sight! If you remember this area and have more memories to share, just let us know!